Have you ever noticed that the coconut milk you buy at the supermarket is, umm, recursive? The tins are labelled "coconut milk", and the ingredients lists also contain within them "coconut milk". For instance, Woolworths Homebrand Coconut Milk is made of "Water, Coconut Milk (32%), Thickeners (412, 466), Emulsifier (435)"—my goodness, it's mostly water!—while Dole's one consists of "Coconut Milk (70%), Modified Starch (1450), Stabilisers (412, 415, 407)". Cans of coconut milk - at least this brand lists "coconut extract" rather than "coconut milk" as one of its ingredients. To find out what coconut milk tastes like without all the additives, I decided to make my own. I had spied some fresh coconuts at the supermarket. It can't be that hard, right? And indeed it was a simple process, albeit a labour-intensive one. For someone like me, without prior experience or the right tools, it was only through sheer stubbornness and background shows on TV that I got through the repetitive actions and minor injuries to write to you today. That, and the beautiful aroma of a freshly grated coconut. I didn't get off to a good start. I threw my coconut into a dark cupboard and forgot about it for two weeks. By the time I took it out again, I could not hear any liquid from within. I guess it must have been old to begin with, because you should it able to store a fresh coconut for up to four months at room temperature. After an initial attempt to saw it open with a sharp knife, I did some research on the internet, and succeeded in cracking it in half with the back of a cleaver, as demonstrated on YouTube. I did not have high expectations, but I have to admit I was still disappointed to see the cracked flesh, dark spots and the beginnings of mould growth. Insides of a coconut that has been around for too long. Not to be deterred, I went back to the supermarket and bought two new coconuts, the largest I could find. The sloshing of the water inside was music to my ears, and after some determined whacks with the cleaver, I had nearly a cup of clear coconut water from each furry ball, as well as reddened palms and bits of brown fibre (known as the coir) from the husk strewn all over the kitchen. Coconut water from two coconuts. Turns out that was the easy part. It took me two evenings to pull the white coconut meat (known as copra when dried) from the shells. Breaking the coconut halves into smaller pieces was difficult enough, but once I managed that, I still faced the task of separating the flesh from the husk, then from the brown skin that encased it. I had the best results when I freed the edges with a knife, then used a spoon to prise the husk away, before removing the skin with a paring knife (you can also use a vegetable peeler). If there is a next time, I might try the technique recommended by David Lebovitz, putting the halves into a pre-heated oven for 20 minutes. A friend from the Philippines told me of a device her family used at home, called kudkuran ng niyog ("coconut scraper") or kabayo ("horse"), which basically involved a round grater attached to a stool, on which you could sit while you shredded the snowy innards. [Added 26 September 2015: I discovered you can buy one of these in Auckland too, in New Gum Sarn!] Whoever invented that is a genius, because they basically bypassed the slow and painful step that resulted in me cutting myself. I was also constantly washing my coconut pieces down to remove the bits of brown skin—this not only took up time, but probably meant I ended up with less coconut extract than I could have expected. Coconut pieces are not the easiest to deal with. At this point, most people would stick the cleaned coconut pieces into a food processor and be done. As I do not possess such an advanced piece of kitchen equipment, I went on to grate the coconut by hand on my third evening at this game. I started off with a fine grater, but as you can guess, I gave up pretty quickly and just used a cheese grater instead. The two coconuts produced a vast amount of coarse shreds, about 13 cups filling a large mixing bowl. Grating the coconut pieces into shreds. On day four, I briefly entertained the thought of making coconut cream without adding water. As I only had a small stick mixer though, I blended the shreds in batches, adding the water from inside the coconut, and about an equal amount of boiled water. To make a thicker milk, I scooped out the fibrous pulp and blended new batches of coconut shreds into the liquid left behind. I then squeezed any further milk from the pulp using a several layers of muslin. I obtained a litre of creamy coconut milk from this first pressing. Coconut pulp in a sieve lined with muslin. I then repeated the process, this time pouring properly boiling water into the pulp to produce nearly another litre of coconut milk, this time a thinner one from the second pressing. In the meantime, my thicker coconut milk had separated into a cream layer and a watery layer. Thick coconut milk from the first pressing (left) and thin coconut milk from the second pressing (right). When I finally went to use the thick coconut milk after another day or so, I was surprised to discover that there was not as much of the cream layer as I thought, and it mixed readily back into the rest of the liquid to form a fragrant blend. On top of the jug with the thin coconut milk though, there was a hard, solidified film of fat, about 2 mm thick, which cracked and floated around like little icebergs. Stirring the surface revealed the cream layer was not actually that thick. Although it had taken me days to make, the coconut milks tasted fresh and flavourful. I am not keen to go through the same process again with that much manual labour, but with some new equipment, or perhaps starting with dessicated coconut instead of fresh, it would definitely be worth the extra effort. I would recommend you try to make this in one go though, unlike me, because this did not keep well, and I began to notice off flavours shortly afterwards. Laksa was probably the first thing that came to mind, when it came to using up my coconut milk. I remembered it was quite a lot of work to make though, and I wanted to try some new recipes too, so I went with some other suggestions. With my homemade thick coconut milk, I made a really easy coconut ice cream. It's vegan, so it is technically not an ice cream, but it tastes amazing, and you only need three ingredients—coconut milk, sugar (I reduced the amount used after reading other people's comments) and vanilla essence! You do not even need an ice cream maker. I did not add any thickeners to my coconut milk, and this produced something in between an ice cream and a sorbet, smooth and quick to melt. You can scoop it straight from the freezer, as an extra bonus! This was not only the easiest, but also the tastiest dish, out of all the coconut recipes I ended up making. Easy, refreshing and delicious homemade coconut ice cream. I also made a Thai Chicken Curry Pie. This time, I mixed in a couple of tablespoons of cornflour into my coconut milk, to ensure it would thicken up on cooking. I only had a nasty, cheap, green curry paste which tasted mainly of chillies and salt, but learning from past experience, I greatly reduced the amount used, and it could not detract from the glory of this recipe. Taking inspiration from Marion's Kitchen, I turned the pot pies into proper little pies by lining a large muffin tray with savoury shortcrust pastry, and also sprinkled sesame or poppy seeds on top. In hindsight, I should have added a bit of sugar to the filling, but this made an excellent meal anyway. With the thin coconut milk, the first thing I cooked was coconut pancakes. As the batter was so runny though, I ended up adding a lot more flour than instructed, and still my creations were not as puffy as those pictured in the original blog. These were nice, certainly much better than the gluten-free coconut flour ones I had attempted on another occasion. Still, I can't say I preferred these over plain pancakes, mainly because soft pancakes appeal more to me than ones with the fibrous coconut shreds inside. Coconut pancakes with clotted cream and maple syrup. I also made the iconic Malaysian dish of nasi lemak. Unfortunately, I was unable to obtain pandan leaves (the shop said there would be another shipment next month), but that was just as well, because I brought the coconut milk rice to the boil over too high a heat, so that the bottom burnt and the top was too wet. Although I did not make the best rendition of the central component, it went well with the usual condiments like fried shallots and peanuts, hard boiled egg and cucumber slices, and sambal. I was left with 10 cups of pulp after making the coconut milk. Using these tough granules up, now that they have been drained of flavour, was always going to be difficult. My coconut pancakes seemed to prove that they could only detract from an otherwise good recipe, but I did not want to simply throw the leftover coconut shreds out. Although the recipe for kale chips with toasted coconut calls for large coconut flakes, I thought the my coconut pulp would work just as well, because it would go crisp that much quicker, and absorb the dressing more readily too. This recipe turned out pretty well, though through my neglect, the leaves were unevenly dried. For the most part they were tasty, but I also had some browned leaves with a somewhat burnt flavour, while other ones were still damp and limp. Kale chips with toasted coconut. 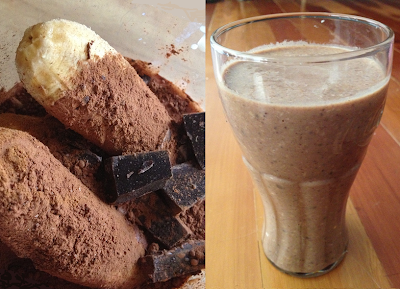 Cookie+Kate's Oaxaca chocolate banana smoothie is fantastic exactly as is, but I found its texture a bit thin, more a milkshake than a smoothie. 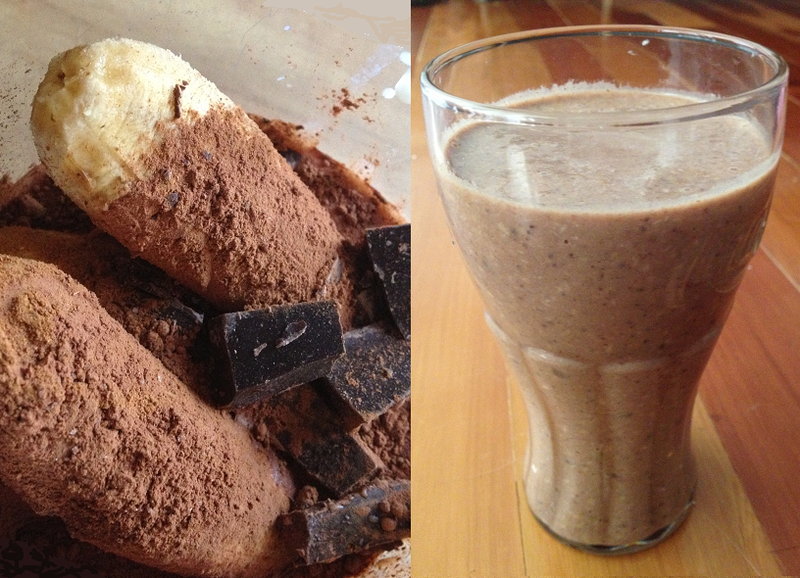 Adding half a cup of shredded coconut made it into a thick and chunky drink that could be a meal in itself. I really enjoyed this, apart from the fact that my coconut pulp had been sitting in the fridge for too long by now, and left an unpleasant aftertaste to an otherwise very enjoyable beverage. I needed no further encouragement to discard the rest of the coconut pulp, but I am glad that I discovered many new and delicious uses for coconut milk and the resulting roughage up to this point. I also have a greater appreciation for coconut milk creation, and how much a product can vary from brand to brand. It's been quite a journey, but well worth the effort at least once. I can certainly picture myself making more fresh coconut milk once I purchase a proper food processor! This post is part of Our Growing Edge, a monthly blogging event aimed at inspiring us to try new things. This month it is hosted by Stacey from The Veggie Mama. I admire your dedication, this is such a thorough post. When I was in Thailand, we made coconut cream using the wooden stool tool. It's difficult to hurt yourself, but it's a hellava uni-tasker to have in a Western kitchen. Yum on the Thai Chicken Curry Pie. It looks delicious. 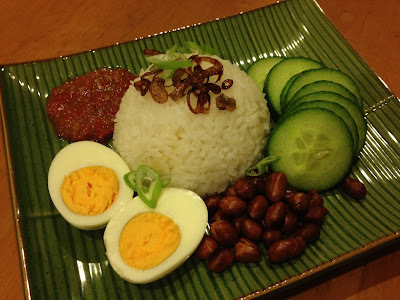 I love nasi lemak but never considered making it at home. It's a shame you couldn't get pandan leaves but your gorgeous plate really is the next best thing. I don't buy coconut milk, preferring coconut cream, but you inspired me to check out the ingredients list. I have Solo's Choice Coconut Cream (Thailand) which lists just 3 ingredients: Coconut cream, E466, E415. Thanks for submitting your post to Our Growing Edge. I've learned heaps from this post. Thanks, Genie. That pie was indeed delicious and I love my banana leaf plate too! I think you are definitely getting the best value by buying coconut cream. It doesn't cost much more than coconut milk, if at all, and you get a higher coconut content (Dole's coconut cream costs the same as their coconut milk and has 85% coconut milk listed in the ingredients instead of 70%). I think I will start doing the same as you too now! Wow that was intense! Good job. I like all the things you were able to make from the product. I remember those coconut grating stools! I didn't really think much of it 'til I read your post. Stuff I took for granted back in the Philippines.. hahah. Thanks, Marnelli. Have you used those stools then? What did you think of them - worth it over buying tinned coconut milk? I will need to take a break from coconut for a while, but after that, I shall definitely try an easier method. Wow, I believe that was a labor of love and curiosity. I don't know how you stuck with it. One day I may just give this a try, but maybe using the grater of a food processor.... Thank you for posting. Haha, yes, thanks! Although grating the coconut meat was repetitive and boring, it was not actually that difficult. Separating the flesh from the husk and skin was a lot more challenging, which is why I guess one of those specialised stools would come in handy. If the oven technique works though, then I guess it would make it easy to prepare the coconut enough to chuck it in a food processor. Other people use dried shredded coconut too, which I may eventually try to see how it compares. Wow, impressive stuff! I think I really want to try that coconut ice cream, though not sure if I will make the coconut milk from scratch. That nasi lemak looks good too... Reminds me to go and bother my mum for her recipe! Yeah, I was amazed by how easy and delicious it was, though it's no doubt just as bad for you as real ice cream. Looking forward to reading about your nasi lemak venture when you make it! What kind of kuih are you making? Hope it goes well! Good on you for choosing the old-fashioned route, though it is a bit more effort to make.